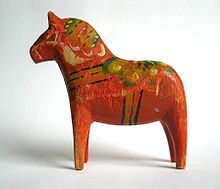 Dalahäst - A wooden painted horse from Dalarna. Language classification: this is a Swedish language resource. This page was last edited on 15 December 2009, at 21:46.